OLYMPIC WATERGUARD Transparent Wood Stain + Sealer has been specially designed to provide complete outdoor protection for your wood. A subtle hint of colour maintains the natural beauty of wood. Ideal for deck, fences, outdoor furniture, railings and siding. Available in 4 ready-mix colours. One coat is sufficient for maximum protection. Armor AllTM Mocha Brown Wood Preservative is a brown solution that provides protection against rot and mildew on sashes, doors, fences, windows, decks and outdoor furniture. It matches new pressure treated wood and is formulated for projects where a brown tint is desired. This product is also suitable for treating end cuts; it is not for use on surfaces that may be in contact with food, feed, or drinking water. BEHRs best wood finish, this advanced 100% acrylic formula penetrates deep into wood to deliver complete protection from the elements for up to 4 years on decks and 6 years on fences and siding. The silicone-fortified formula delivers excellent protection from the sun's harmful UV rays. 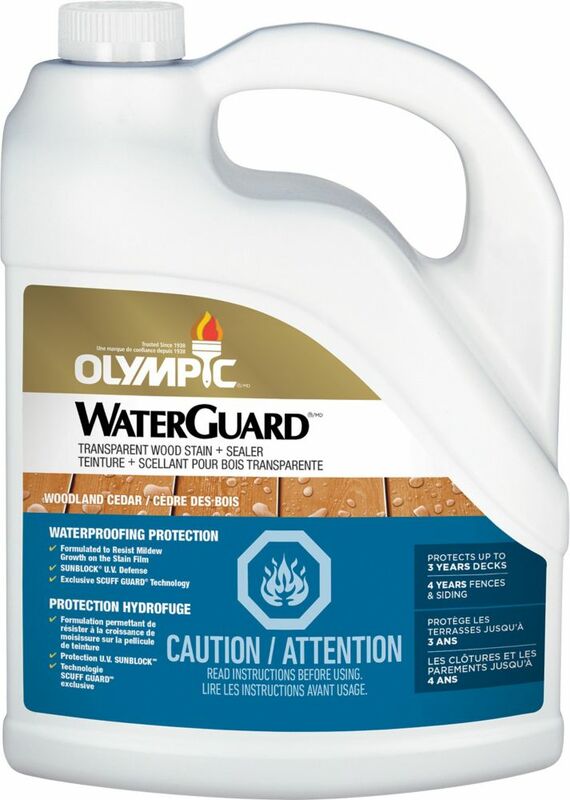 Oly WG Trsp S+S W Cedar 3.78L-55167C OLYMPIC WATERGUARD Transparent Wood Stain + Sealer has been specially designed to provide complete outdoor protection for your wood. A subtle hint of colour maintains the natural beauty of wood. Ideal for deck, fences, outdoor furniture, railings and siding. Available in 4 ready-mix colours. One coat is sufficient for maximum protection.